Coming Soon to Wilmington, NC!! The Foxes Boxes, using the theme “think outside, eat inside”, was dreamed up by the Fox Family–a mom, dad, and three teenagers, who have a passion for affordable, creative, eateries that also embraced their passion for social causes. With a goal to become a certified B Corporation, The Foxes Boxes will partner with community organizations working with marginalized populations to provide on-the-job training that incorporates leadership development, relationship building, and strong interpersonal communication skills, generating a valuable workforce for the hospitality and service industry in our region. Talking food—the idea behind The Foxes Boxes is to create each guest a box filled with a variety of menu selections from fun categories such as The Gourmet Box, The Basic Box, The Party Box, or The Date Box. With tablets on site and an app, guests can create their own boxes to be picked up at their convenience or dine-in surrounded by a fun, engaging, and welcoming atmosphere. 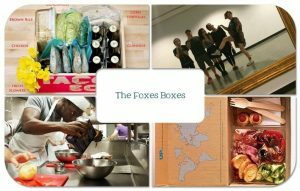 The Foxes Boxes will prepare a variety of seasonal menu options and baked goods with ingredients from fresh, local farms and urban gardens. Nothing fried, and everything delicious! The initial restaurant will be located in the Brooklyn Arts District of downtown Wilmington, North Carolina.